Happy new year! As winter plods on, it's a great time to reflect on the past year and make resolutions for the new one at hand. We're excited to make 2014 the craftiest year yet at the Woolery, and we hope you'll join us! There are plenty of ways to get crafting and STAY crafting - below are just a few ideas to consider. We'd love to hear about your own crafty resolutions! Find your community. Whether it's online or at your LYS, finding a group of fellow crafters is a great way to exchange ideas and stay inspired. If you're fortunate to have a local guild, they may have a group which meets regularly (or they may know of one to refer you to). Ravelry is another great spot to check for knitting, spinning and weaving groups in your area. Mark your calendar. There are plenty of special events to enhance your crafting in 2014! Fiber festivals, craft conventions, and workshops make great day trips (or destinations to dream of). In fact, there is an exciting event happening in our neck of the woods next month: The Fiber Frenzy Retreat in Lexington, KY, which is taking place February 21-23! The Woolery will have a booth at this fiber-licious event, and we hope to see you there. If you aren't able to travel far and wide, consider joining a virtual event this year such as the Tour de Fleece, Spinzilla or Halloweave! Try a new type of fiber. Spinners have access to all kind of breed-specific fleece, roving and top, but fiber artists who don't spin can still get in on the fun! Make it your mission in 2014 to be on the lookout for interesting fiber combinations when shopping for your next project, it's a quick and easy way to make crafting lively in the new year! Expand your skillset. You can delve deeper in your chosen area by learning advanced techniques for spinning, weaving, felting, knitting or crocheting. There are plenty of books and DVDs for those who prefer to learn at home (or you might want to check out our YouTube channel for free tutorials); hands-on learners may wish to sign up for a class or workshop. Try a totally new-to-you craft. Weavers, knitters and crocheters may be interested in adding spinning to the mix, while spinners may like to give needle felting a try...what a great way to use up those odd bits of fiber in your stash! If you find yourself with too much yarn on your hands (is that even possible?? 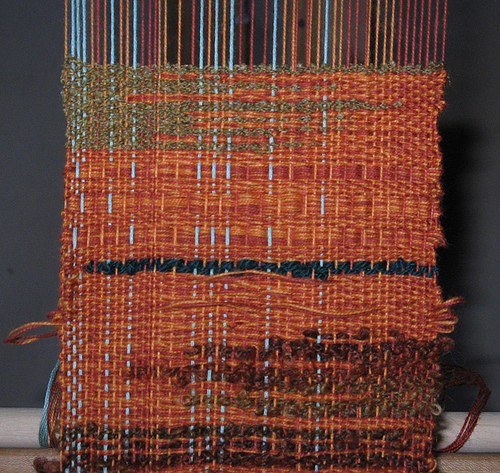 ), weaving is a great way to destash quickly - knitters and crocheters take note! If you get stuck, we have a support thread right here in our Ravelry group where you can ask your questions and get help from our team of experts (as well as our knowledgeable group members)!